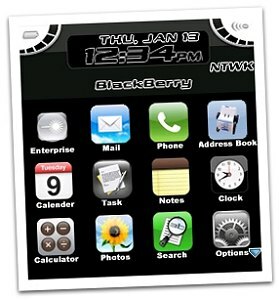 iPhone Skin for Blackberry | BlackBerry Blast! Last week there was a big stir when someone created an iPhone skin for Windows Mobile devices. Apparently nobody cares whether or not they receive a letter from Apple's legal team because now there is an iPhone skin for the Blackberry. One of the readers over at BlackBerryCool has come up with a skin for your Blackberry that looks an awful like the iPhone display. Hopefully this one will not cause quite the commotion that the Windows Mobile iPhone skin caused, but you never know.